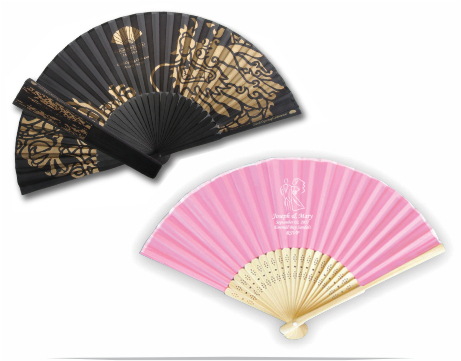 Personalized Folding hand fans are the perfect compliment to any wedding, party or special event. Economical, durable and long lasting, they will add a decorative touch to your event, and remain as a long lasting memento. 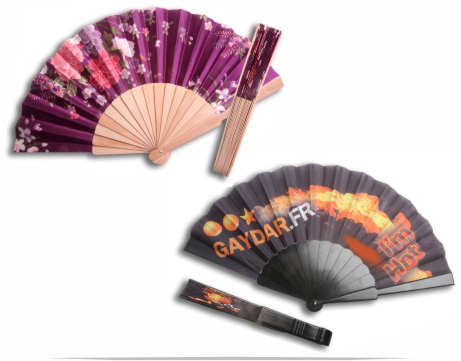 Our custom printed fabric, paper, silk and plastic folding fans are available with your custom imprint and you will be sure to find one that will match your theme and budget. You can choose from our collection of backgrounds and layouts, design your own or let us do it for you. 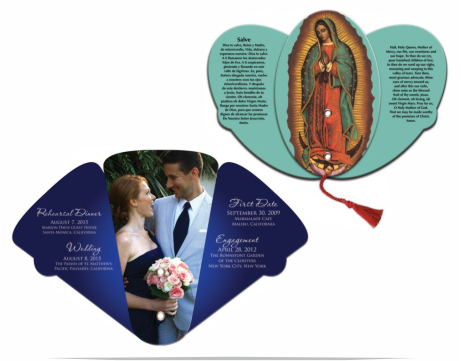 Our decorative and custom printed fans not only make great wedding and event favors and souvenirs, but have a myriad of uses before, during and after the wedding ceremony or event. Fan Invitation - Have your event or wedding invitation printed on a fan. We can even provide RSVP cards and inserts; as well as mailing boxes, envelopes or mailing tubes. Fan Program - Printing your wedding program on fans adds an elegant decorative touch and keep guests cooler and more comfortable. 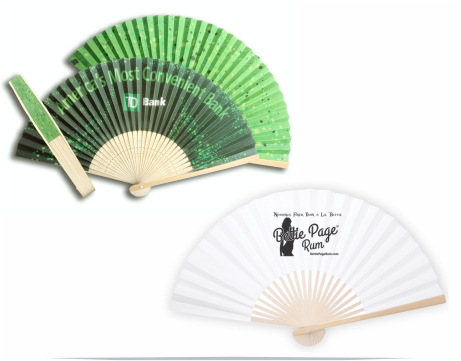 Promotional Folding Fans - Perfect for promoting your business, club, organization or event. Fan Menus - restaurants, weddings, events - Print your menu on fans and put one at each place setting. Fans for Sporting Events and Rallies - Sports fans can show their spirit as well as keep cool. Give fans to your fans! Provide each of your guests with the “Language of the Fan” and watch the fun begin! Word and pdf files are available on this website. You can provide your own artwork or we will design it for you. We provide you with the templates and guidelines. You can view our STANDARD FONTS, LAYOUTS and CLIP ART as well as links to online resources by visiting the ARTWORK section of our website.